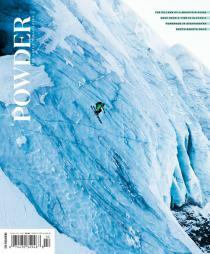 Established in 1972 as "The Skier's Magazine," POWDER is dedicated to honest, informative, and entertaining storytelling for a community of loyal and passionate readers dedicated to a life lived among mountains. Forty-six years after its founding in Sun Valley, Idaho, the magazine remains the heart of the publication and the most valuable extension of the brand, while its network has grown to include digital and social media, books, radio, film, and events. Since 2015, the title has been nominated for three National Magazine Awards from the American Society of Magazine Editors, including one of five nominations for General Excellence, Special Interest and Best Photography, in 2017. Don't miss a single issue! Subscribe now! We will continue to renew your Powder subscription at the rate then in effect, without interruption, unless you tell us to stop. At the end of your subscription you will receive a notice prior to your credit card being charged. You may cancel at any time during your subscription and receive a full refund on all unmailed issues by visiting the Online Customer Service Center. If there is ever a problem with the card you provide, we will simply bill you instead.